Many of you are probably familiar with the term “Plantar Fasciitis” or may have even been diagnosed with it in the past. However, how many of you truly understand what the plantar fascia is or what is causing you to have terrible pain in your feet? 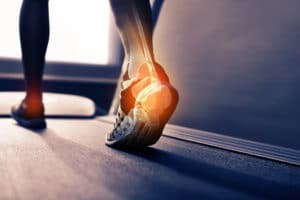 This blog post will go into the details of the diagnosis of Plantar Fasciitis, including what causes it, common signs and symptoms, and different treatment options to help get you back on your feet faster! The Plantar Fascia is simply a long sheath of connective tissue on the bottoms of your feet that extends from the heel bone to the balls of the feet. The purpose of this broad, fibrous sheet of connective tissue is to add stability to the foot while the foot is in a weight-bearing position (i.e. Walking or going up/down stairs). When this fascia gets irritated, it may become inflamed, weaken, and eventually start to form scar tissue, all three of which may cause pain to a person. As you can see, physical therapy can be a great help to patients undergoing signs and symptoms associated with plantar fasciitis. Research shows that about 10-15% of the US population will experience symptoms associated with plantar fasciitis each year. On a more positive note, approximately 90% of the cases are successfully treated with conservative care such as physical therapy. So, if you are experiencing pain in heel of your foot or feet, stop on in so we can help you get back to walking the boardwalk at the beach or getting back to training for that marathon!